TIRION -Landkaart van den Volkplantingen Surianme en Berbice. TIRION, Issac - Landkaart van den Volkplantingen Surianme en Berbice. 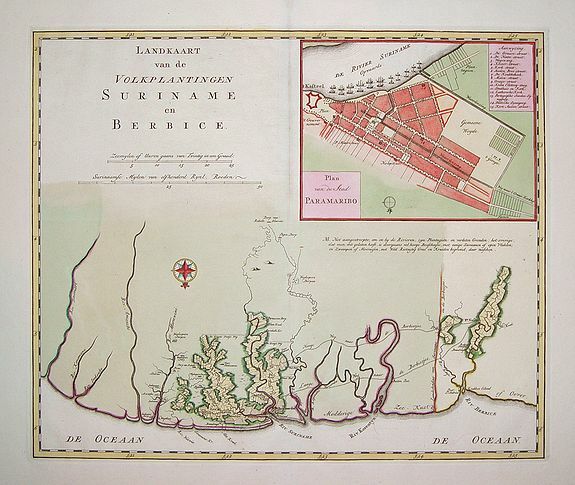 Title : Landkaart van den Volkplantingen Surianme en Berbice..
Map maker : TIRION, Issac. Date : Amsterdam, ca. 1755. Size : 13.3 x 15.8 inches. / 33.8 x 40.1 cm. Description :Beautifully delineated map of Suriname identifying major plantations, waterways and towns. There is a plan of the capital, Paramaribo, in the upper right and corner with a legend that identifies 15 key sites. Excellent presentation value. Condition : In near-mint condition. Strong, dark impression on thick, sturdy paper. Ample margins.